Those that have been long time readers of IFTLE and its predecessor PFTLE know that I sometimes look at 3D IC through the eyes of someone that was part of the bumping/WLP technology explosion that occurred in the late 1990s/early 2000s. Further, if you know this history you know that while I give most of the credit for the development of most if not all of that early low cost bump/WLP technology to start ups FCT and Unitive in the USA, it was the Taiwanese who saw the power of this technology, licensed it from the aforementioned startups and put the capacity in place to make this the key technology that it is today. While fan-in WLP has evolved into fan-out WLP and copper pillar technology it has in some sense has become synonymous with “Advanced Packaging”. The Semicon Taiwan 3D Technology Forum was chaired by Ho-Ming Tong, General Manager and CTO for ASE. Speakers included representatives from Yole, Nokia, Qualcomm, UMC, SIliconware, Verigy, Applied, ITRI, IME and Sematech. The next two blogs will cover significant material from this meeting. Dr. Tong, who some say coined the term "2.5D" for the use of silicon or glass interposers with TSV, indicated that this technology “..is ready to move to the next stage” Tong expects commercialization of 2.5D chip technology to take place in two years. 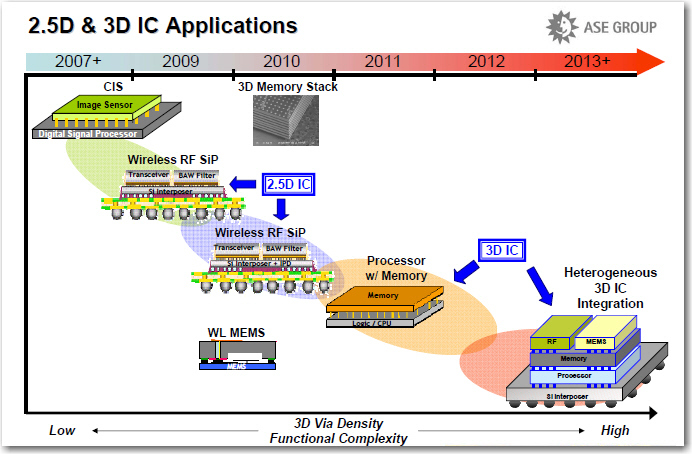 Tong notes that 2.5D IC should not be regarded as a transitional integration technology. 2.5D will enable packaging of chips in the 32-22 nm nodes where the fragile mechanical stability of the low-K dielectrics used in these products will require their bonding to an intermediate silicon interposer before final placement in a standard package. Tong believes that commercialized products made using 2.5D IC and 3D IC technologies, including smartphones and computing applications, will hit the market in the next five years. This last comment made headlines at several news outlets [ link], which Quoted Dr. Tong as saying “ Despite tremendous progress in recent years, 3D IC with through silicon vias (TSVs) still presents significant challenges in cost, design, manufacturing, test and supply chain readiness and the technology is still three to five years away from mass production”. After checking with Dr. Tongs colleagues in ASE I have been assured that these comments were meant to indicate that widespread use in products is still 3-5 years out but that ASE stands by the recent roadmap they shared at Semicon West this summer [ see IFTLE 9 “3D In and Around the Moscone Part 1” ] which indicates that 2.5 D readiness is imminent and full 3D for wide IO DRAM / logic bonding would be coming in the 2011 timeframe. Shan-Chieh Chien, VP of ATD at UMC called 3D stacking with TSV the “big elephant” technology for foundries. 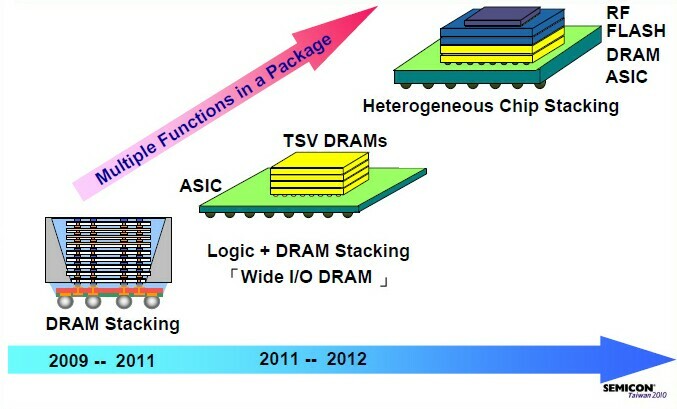 UMC, which recently announced an alliance with Elpida and Powertech [ see IFTLE 8 “3D Infrastructure Announcements and Rumors” ] commented that logic + wide IO DRAM stacking will occur in 2011-2012 consistent with the comments of his other Asian colleagues. UMC also sees a significant future for silicon interposers indicating that UMC will use their Cu dual damascene BEOL process for passive device and fine pitch RDL on these interposers. A new IC Insights image sensor market report forecast that CMOS image sensors sales will rise 34% in 2010 to $5.2 billion from ~ $3.9 billion in 2009. Between 2009 and 2014, CMOS image sensor sales are projected to increase at a 17% compound average growth rate (CAGR), reaching $8.3 billion by 2014. 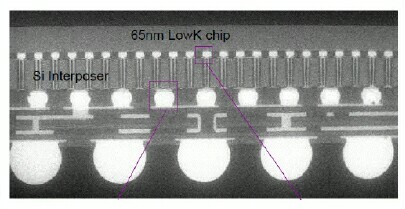 CMOS image sensors dominate portable systems applications, such as camera phones, webcams in notebook computers, and other embedded cameras in handheld products, but higher-speed CMOS imagers are also being aimed at automotive systems, medical equipment, and wireless video security networks.